The Galaxy Note 8.0 fares the best, which makes sense, since it's the most premium of the tablets. In addition to the $25 Google Play credit that's been active since launch and previous Hulu Plus and Boingo Wifi access, new owners can register for 50GB of free expanded Dropbox storage for two years and $50 of credit in Samsung's WatchON movie store. The Dropbox and WatchON perks are brand new as of today - they aren't even mentioned in the legal fine print from last month. 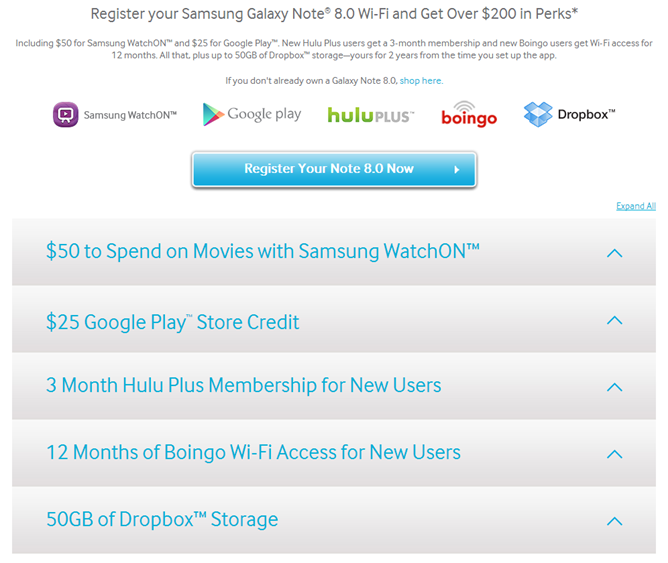 Those who buy the new Galaxy Tab 3 in its 7-inch, 8-inch, or 10-inch variety or a Galaxy Tab 2 10.1 Student Edition get the Boingo WiFi access, three months of Hulu, plus the newly-added free Dropbox storage. But the Google Play credit is dropped to $10, and there's no WatchON credit. (By the way, you should probably read Ryan Whitwam's Galaxy Tab 3 8.0 review if you're considering a purchase.) Even so, the Dropbox storage is worth about $120 based on their Pro pricing, and if you really do choose a Samsung tablet over the compelling alternatives, this should make your new hardware all the sweeter. Unfortunately, it looks like the extra goodies are active for new purchases only - I tried to use the information from my own Galaxy Note 8.0 for the new offers, but I was denied because I'd already redeemed the Google Play credit back in April. 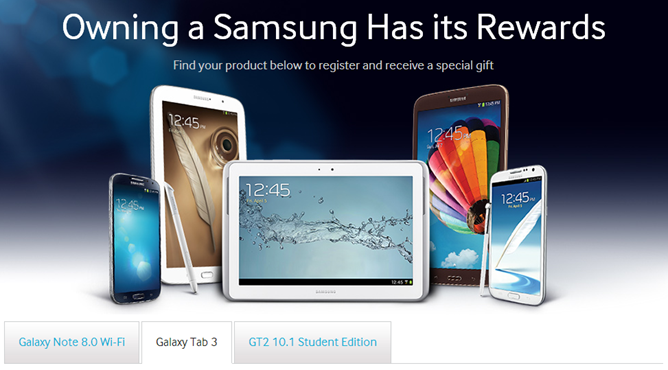 To redeem the free offers you'll need to setup a Samsung account and hand over a little personal information, as well as a WiFi MAC address and your tablet's serial number. The current promotions are valid from now until September 30th. Purchases from any United States retailer can be used in conjunction with these rewards.